SHORT BIOGRAPHY : From the album: "Maro Djipen"
Titi Winterstein,born in 1956 in Breisgau(Germany)is a descendant of a gypsy family.He's father Tokeli endured the horror of a concentration camp toghether with his brother.Unfortunately,these two were slaughtered by the racist forces of the Nazi regime. Titi's father was 18 years old when he was freed from the concentration camps of Auschwitz and Bauchenwald. Titi grew up in a place called Fort Hartenberg close to Mainz. His father show him the rudiments of the violin when he was 8 years old. Shortly before his 9th birthday ,Titi appeared for the first time on a stage at a party that marked the end of a gypsy pilgrimage at Illingen,Saarland.Four years later,age 12,he performed the same place and under similar circumstances.He both surprized and amaze everybody by playng swing music by Schnuckenack Reinhardt and ended up stealing the show.In 1972 the guitarist Hans'che Weiss found a quintett asking the young Titi to join it. In 1973,he recorded his first lp :"Musik Deutcher Zigeuner". - 1977 : Fünf Jahre Musik deutscher Zigeuner,this last album won an important prize in Germany: the Deutscher Schallplattenpreis. After this Hans'che Weiss quit the group. In the 14 May 1978 at the "Festival der Jugend" in Dortmund born the Titi Winterstein Quintett,Titi was 21 and the group was formed by the same people except Hans'che Weiss who was replace by another excelent solo guitarist : Lulu Reinhardt.The quintett was also joined by the pianist Silvano Lagrene. - 1985 : Dijnee to kowa ziro with Geisela Reinhardt (Lulu's young brother)on rhythm guitar, Klaus Bruder on accordion and Peter Gropp on contrabass,and with the partecipation of Holzmanno Winterstein. - 1987 : Live mit Vanessa & Sorba same formation of the last with the partecipation of two polish singers:Vanessa Merstein and Sorba Kwiatkowski. - 1994 : Maro Djipen Holzmanno Winterstein on rhythm guitar and Banscheli Lehmann on contrabass,with the return of Silvano Lagrene on piano. - 1978 : In the same year in wich born the Titi Winterstein Quintett, a short documentary was filmed(45 min)for the television telling the lifes of the musicians and them families. - 1979 : A second documentary filmed at the Festival de Darmstadt wich present the quintett. - 1988 : The group appear in the tv serial "Tatort",in an episode called "Armer Nanosh !" - 1993 : Titi plays with the great violinist Yehudi Menhuin in a festival called "All the world violins" in Brussels . He was also invited to join a documentary on the life of gypsy and jewish people. on this site you can find also biography of the musicians who played and play now with him,comments and extract of the records. The style of Titi Winterstein is unique,he can play with an incredible energy and rhythm,as well as he can play the more sweet and "pianissimo" notes.He have a melodic sense of improvisation and a touch that make him to be not a "simple" virtuoso,but something more. i note that the ones with Hans'che Weiss Quintett are very close one to another.In these albums,Titi have an amazing and virtuoso playng(ha was just 17)in wich he express energy and tecnique. musical maturity and a perfection of tecnique. Is not the case of Titi and we can verify it in the albums with his own quintett in wich he show to be a great musician,growed up with the faculties of a virtuoso but without showing it more of the necessary,putting attencion on his arrangements and his own compositions as well as on the improvisations. Ending i invite you all (in the case you haven't already done)to listen to this great musician! is there a way to attach the image that i have in my pc like here on the wiki? Sadly I have heard just today about his desappear, something like two weeks ago. Titi Winterstein (1956-2008) is dead in 14 juin 2008. 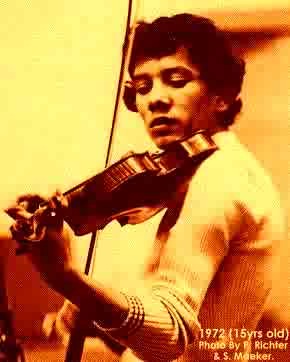 A really great violinist , this is a big loss for the music. Please can you tell me who the lead guitarist is on this CD? "Dijnee to kowa ziro "